space Too many times I listen to a new album and immediately become completely convinced that it is one of the best albums of the year. Usually after I sit with it for a few more weeks it becomes clear that although a good record, said album is nowhere near the best album of the year. I put off writing anything about Australian trio Cut Copy's second LP, In Ghost Colours, in fear that I might be jumping the gun on thinking that this may be the best album of 2008 thus far. I have always been a sucker for 80's era synth-pop, so most bands that attempt to join the revival of that vibe in music will at least get a few listens out of me. 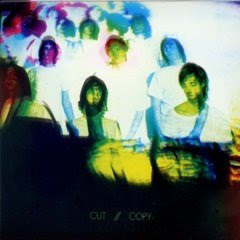 They do have many contemporaries who are attempting the same things they are, but none even come close to doing it as well as Cut Copy, especially the ability to meld electro and rock so seamlessly. To be honest, there isn't anything groundbreaking going on here but everything is just so perfectly written, produced and executed that it's impossible not to find something to like. I predict that for those that do hear this album, it very well could be the album of the summer...it just has that feel to it. I suggest you get yourself a copy of In Ghost Colours as soon as possible, preferably before it finally gets warm.